Updated with new features for LightRoom Classic CC! Are you interested in learning some great techniques to process your images using LightRoom? Do you learn best by watching video tutorials to supplement your reading? Then this e-Book and video series is for you. LightRoom for the Nature Photographer contains a PDF e-book for your reading pleasure as well as nearly 3 1/2 hours of step by step video tutorials on a processing your images using LightRoom. 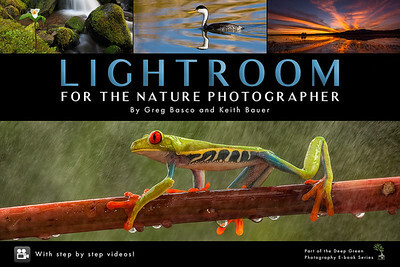 Gregory Basco and Keith Bauer have worked hard to produce this exciting e-book to help nature photographers just like you improve their knowledge and post processing skills in LightRoom.